While the vast majority of PDF files are intended for viewing and printing, PDF is a superb environment for dynamic data display, collection and manipulation. Take existing paper or electronic forms and make them fillable. Retaining the exact look and feel of your original form or allow you to easily move forward with a new, current design. Data Validation including data formats (i.e. phone numbers, social security numbers, etc.) and required fields. 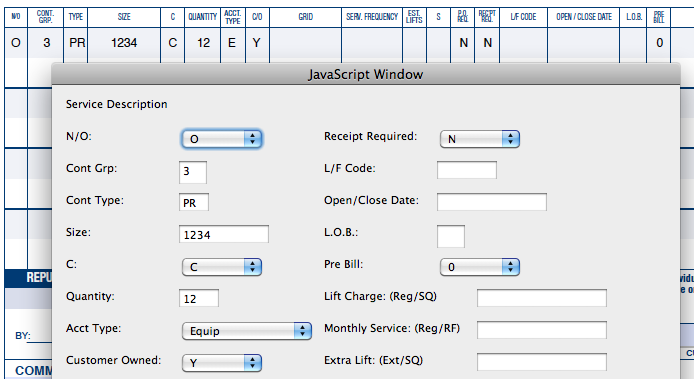 Control User Entry by providing selections in drop down boxes and filtering the options based on previous selections. Allow users to return completed forms and data via email or submission to a server. Apply custom buttons for printing, resetting, submission and other functions. Perform calculations from simple sums to complex custom formulas and display the results. Collect large amounts of data using a dynamic, single page front end. Implement pop-up dialogs to facilitate data entry on complex forms. Use PDF fields and annotations for dynamic graphics displays such as line/bar graphs, flow charts, dynamic tables, etc. Drop down fields may be used to filter other fields so that only options applicable to the user’s selection are available to be filled. In this instance Bed/Bath combinations, options and rental terms available are set based upon the unit type selection and once final selections are made the rates are loaded automatically. Custom buttons can be used to submit to a specific server, print a required page range or any custom function available in Adobe Reader. Bar and line graphs can be used to make comparisons among sets of user entered data or to compare user data to a stored average value.